Nicole Hoffman, age 26, lost 90 lbs. with 21 Day Fix, 21 Day Fix EXTREME, and Shakeology. 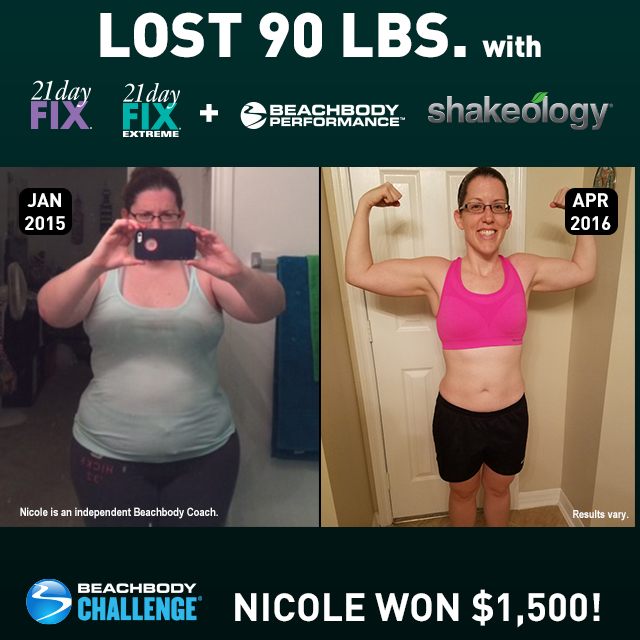 She entered her results into the Beachbody Challenge, and won $1,500! Before the program, I was tired, worn out, and feeling horrible about myself! I knew I looked horrible, older than I actually was, and felt the exact same way. Here I was, 25 years old, and feeling like someone 10–15 years older than that! At 25, I should have a ton of energy and be living an active lifestyle, right?! Totally not what I was doing. My fiancé and I would do whatever we wanted, whenever we wanted, however we wanted. When we came home after work, all we would do was eat food and watch TV. That is it! I started having poor self-image and feeling really bad about myself. I had no confidence at all, and didn’t feel worthy of my fiancé. I hated looking at myself, and my mood reflected these feelings. Well, there were two main things I would say that inspired me to get going! First, my younger sister started the 21 Day Fix program about three months before I even gave it a thought, and she saw crazy results! I could not believe her transformation when I saw it. Second, going shopping. One morning, my fiancé and I woke up and realized that our clothes did not fit us anymore! I had all of these super-cute clothes that I used to wear out to parties and on dates with him that I could no longer even fit one leg into, let alone two. When we went shopping, as we spent hours looking for anything that fit me, I broke down into tears crying hysterically because of the sizes I was now being forced to purchase due to my terrible lifestyle. No woman wants to feel like that or be put into that situation. I needed to do something and do something fast before my habits got out of control and before I could feel any worse about myself. There were two main things with this as well. First, changing our eating habits to fit the 21 Day Fix eating program was going to be a huge challenge for us. Like I said, we would eat whatever we want, whenever we wanted, no matter what it was. Even if it was fast food at 2 AM, we’d go right to bed after eating it! I used to be able to sit and eat an entire Digiorno pizza by myself in one sitting! We also loved processed, fast, and cheap foods, and getting used to the new clean eating habits was going to prove challenging. Second, working out was going to be a challenge for us as well, because we were living a mainly sedentary lifestyle. So finding the motivation to try these physically challenging workouts was going to be hard. What helped us overcome these challenges was the simplicity of the program. The program lays out exactly what you need to do and when you need to do it. Having that type of structure and tools available to us really helped us be successful throughout. I am absolutely in love with the portion-control containers that the 21 Day Fix and 21 Day Fix EXTREME have given me. Without the portion control, our nutrition would not have been as on point as it is, and we would have not seen these results. I can not say it enough: nutrition is the key to success! The containers in the 21 Day Fix and 21 Day Fix EXTREME really give you the flexibility to still eat what you want but in modified portions. I loved that the program told me how many of each I can eat every day, but then I have the freedom to fill those containers how I choose (according to the food list of course!). It is so easy to keep track of how many containers you eat every day, and also to make sure that you are getting those containers in. I love it so much that I am still following it to this very day, and have my family following it as well! We still eat macaroni and cheese (my favorite), and of course tacos, pizza, and French fries, but in healthy versions! I have lost over 90 pounds in a little over a year as well as going from a size 18 to a size 4, and this is thanks to Beachbody! My goal when I started was to fit into a size six wedding gown. I am getting married in September of this year, and wouldn’t you know it, I was able to buy a size six wedding gown! I think I will be a size two or four by the time the wedding actually comes now! I never thought in my entire life that I could do this. Even in high school, I was always a size 10/12, and here I am, rocking it! I have so much more definition in my legs and my arms, and for the first time in my life, I will be able to wear an actual bikini to the beach on our honeymoon! Besides the physical achievements that I am ultimately proud of, I have more energy, confidence, and motivation to keep going to reach my ultimate goals. I also have been able to inspire so many other people who have been experiencing what I was going through, which is amazing! My life has changed drastically! Because of the results I have seen, I am ultimately happier about my life and it affects my mood day-in and day-out. I no longer cry about going shopping; instead, I am ready to go! I feel sexier in my skin, and that translates into a better relationship with my fiancé. I have also learned soooooo much about food and how it fuels your body from the program. Never did I know or realize what the difference between healthy and unhealthy fats are and what each does to your body. Who knew?! I know what to eat to give my body the proper nutrition it needs to not only function at 100 percent, but also to lose the weight that I have been so desperate to lose. I seriously thank the 21 Day Fix and Beachbody for all of that! I also cannot go a day without doing my Beachbody workouts! I love the workouts, and what they do for me. They are easy to follow, and make me break a sweat no matter what video I am doing.